now, as the swimsuit competition commences…. on friday night, i somehow managed to wheedle nick into joining me for a tango lesson + milonga on campus. ;) orkan and arzu are already tango enthusiasts, and invited us to join. now, i have always been a tango freak in spirit, and i took a year or so of classes and workshops back in college with my friend, carlos. 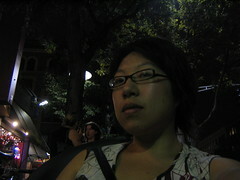 we would practice on the sidewalks of harvard square, tango in the entryways in front of amused onlookers in our dorm. i love love love tango music, and desperately hope to travel to buenos aires one day! that night both of us were learning as if from square one; and it’s amazing how easy it sounds to just walk in step with a partner, but it truly is harder than it looks. the dj at the milonga was a little wacked out, interspersing old-skool tango music with like, bhangra or disco interludes, but perhaps that’s just the typical type of intercessions at these things. who knows? i had lotsa fun (thank you to both nick and orkan for the gracious dances! ), and hopefully when i finally have some spare time, i can take some additional lessons and get back into the scene! wait a second… miss puerto rico’s officially listed interests include: weightlifting, watching reality tv, and yoga. last night, we went to two small get-togethers, one at a friend’s in davis square, and then afterwards a birthday bash-ette for nick’s roommate at zuzu in central square, cambridge. 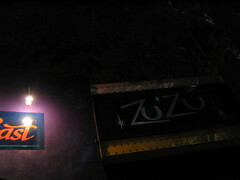 zuzu is a lovely place for dinner, great drinks. they offer middle-eastern mezes, and the kebabs are delish. however, i’ve never been there for a nightscene, and it is altogether mindblastingly LOUD. plus, the dj was playing the dorkiest music ever (60s? oldies? ironic nostalgia?) in the name of coolness, and hipsters and their bad haircuts were cavorting in their vintage boots and striped H+M. anyway, i dont mind the indie crowd (they’re cute! aww…) but it was so loud you could only hear the person directly next to you, and with screaming at the top of your lungs. that said, i stepped outside often to take a break from the roar. am i getting old already? do those girls have those sashes surgically attached to them, or what? they always have them on! so, i’ve been rewarding myself for completed sections + chapters… by shopping! i have a fondness for shoes, cosmetics, and lately, earrings. i’ve never really got up to getting my ears pierced, and so i still have intact lobes. 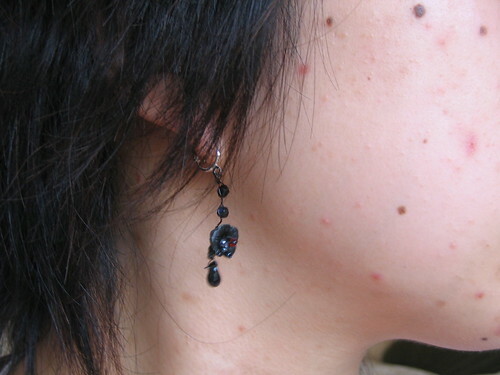 therefore, i can’t really wear most styles because of the piercing issue. i’m a little miffed on filene’s closing downtown because they had the best clip-on section (the ‘monet’ brand, which already is a little matronly sometimes), and the macy’s selection is completely laughable. wow, i LOVE miss japan’s evening gown dress!!!!!!!!!! she looks amazing! it’s very very modern! the first pair are a cool, basic but intricate, set. i love the flowers, they’re almost like plum blossoms, with slightly dark purplish beads at the center. kind of handcrafted look and off-bent. the second are kinda fun, and i *love* the aqua color. it’s sort of matte and pure, like milky sea glass. although they’re big, they’re very light and airy looking. and the last have so much movement! 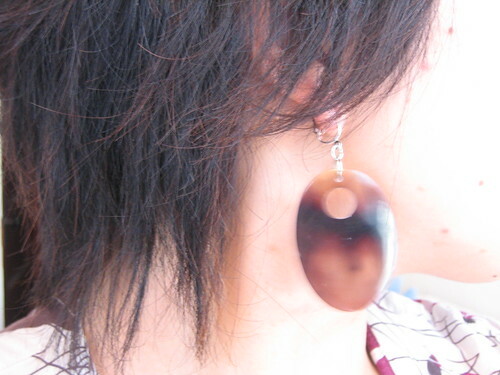 they are coloured like tortoiseshell, are semi-translucent, and the colours swirl in an organic variegation. yay! i’m very excited, and also waiting on two custom orders from etsy from greentangerine. i can’t wait to report on them, they’re superb! wow, kayne’s dress looks amazing, and no major edits at all! however, tara conner looked a little uncomfortable… nerves? hard to walk? constipated? so one last thing. i’m terrified at the condition of my skin. it’s just gotten worse and worse, and i am breaking out constantly. i dont know if it’s stress related or what, but i want to see a doctor about it. i think i’ll schedule an appointment at MIT, but i’m also considering seeing a licensed esthestician at a clinic downtown or something. my yarn pal, catmum, actually works as a medispa RN! i’m very grateful for her tips and advice, especially in this realm of questionable medical ethics when high promises and high costs are tossed around. i’ve ever so curious about the obagi skincare system, which is only prescribed by a physician. i mean, looky! i am most closely aligned with the case of the gal at the bottom. right now i’m trying out l’oreal acne response acne system, a salicylic acid / glycolic acid sort of chem peel at home. we’ll see how it goes, but patience is not one of my immediate virtues! I’M ROOTING FOR MISS JAPAN! she’s amazing! she answered her warm-up question in french *and* english. she studies french cinematography and flamenco dancing. she’s the most ‘real’ and down-to-earth of the finalists (that’s relative, sure, but at least she’s not trying to pull off the collagen lip injections like some of them) and seems actually intelligent. >yes, this dress is it! 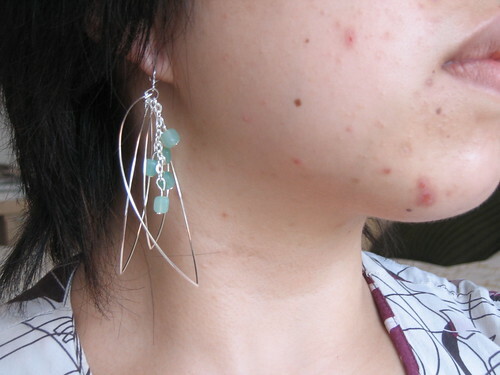 >That last pair of earrings are freakin’ awesome. I love shell danglies.I’ve got no suggestions for skincare, other than drinking lots of water and being sure to use sensitive skin everything! Sometimes I use clearasil for spot treatment, but it really dries out your skin and isn’t really good for you. It could just be the recent stress (and heat). >That is a great dress!